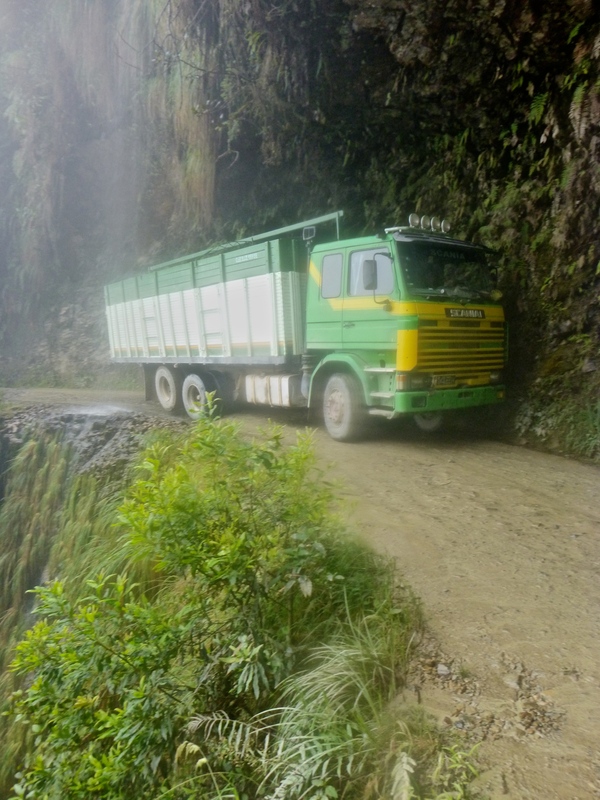 One outdoor adventure excursion offered daily from numerous tourist companies in La Paz is advertised as “Biking Down The Most Dangerous Road In The World.” This road, Yungas Road, is located in the town of Coroico approximately 60 kilometers northeast of La Paz. 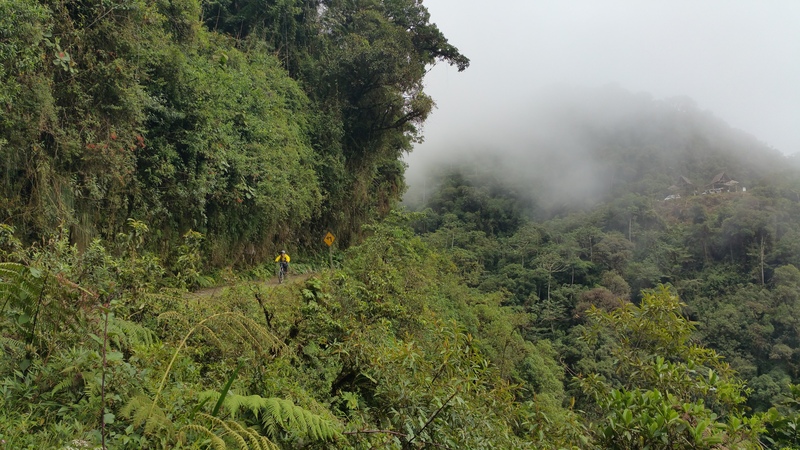 Despite its technical terrain, steep downhill curves, lack of guardrails, narrow single lane, high cliffs, fog, and water runoff from the rainforest, it’s really not as dangerous as it sounds. With common sense (and maybe a little cycling experience) and the capacity to clutch onto your brakes for a couple of hours at a time, the bike ride is not dangerous and is breathtakingly beautiful. After an early morning start and about an hour and a half of driving, we were ready to go. The first portion of the ride was a beautiful, smooth cruise down paved roads. 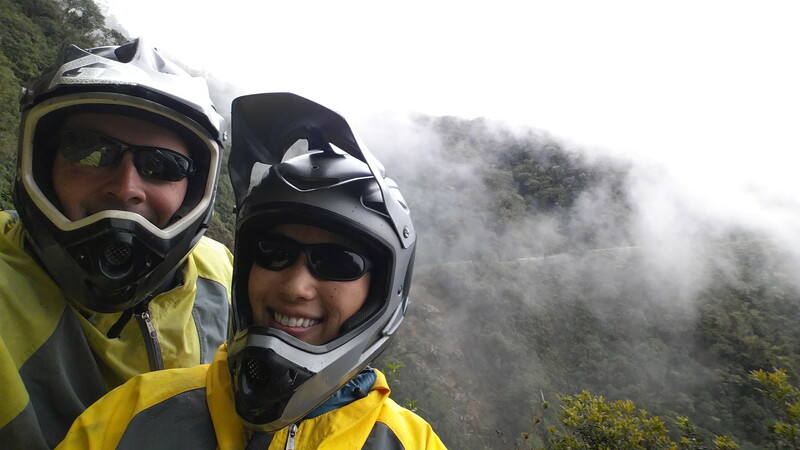 Because the starting elevation was ~3,000 m and the ending elevation was ~1,500 m, we began the ride high above the clouds. As we soared down the windy roads, we literally zoomed through wispy clouds that gathered in the valley between the mountains and hills. 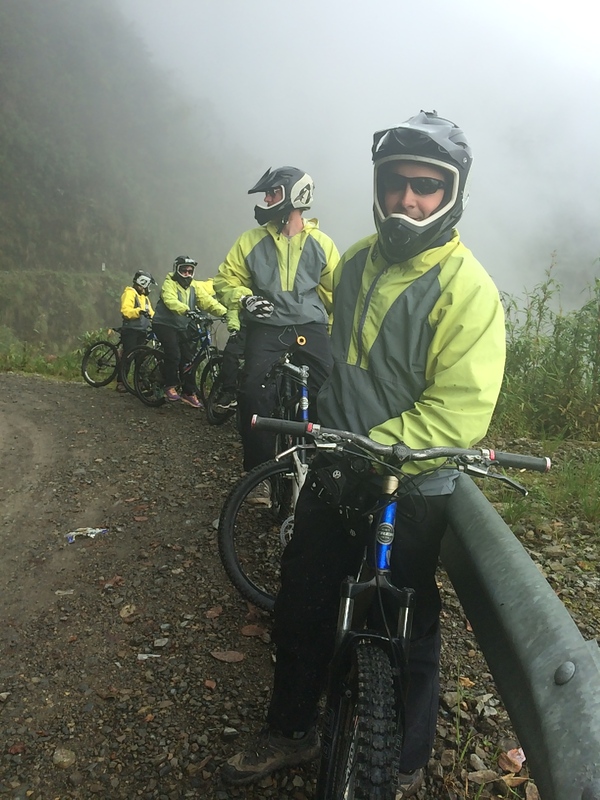 By the time we reached the “most dangerous road in the world” we were quite enveloped by clouds, mist, and fog. Yes, the terrain was technical. Yes, there were loads of rocks. Yes, there were trucks that needed to pass by every now and then. And the road was uneven, steep, and curvy. Only one girl in our group lost control and fell off her bike, bruised one side of her body, and smashed her phone…but she was inexperienced. 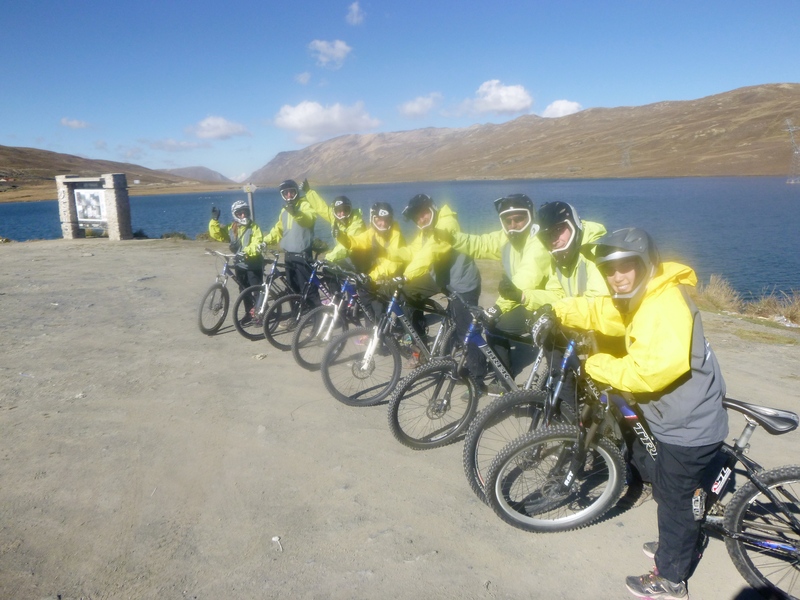 It is said that 18 cyclists have died since cycling tours began in 1998. I assume they were all inexperienced. There were trucks!!! OMG! Look at this one steering clear of the cliff. 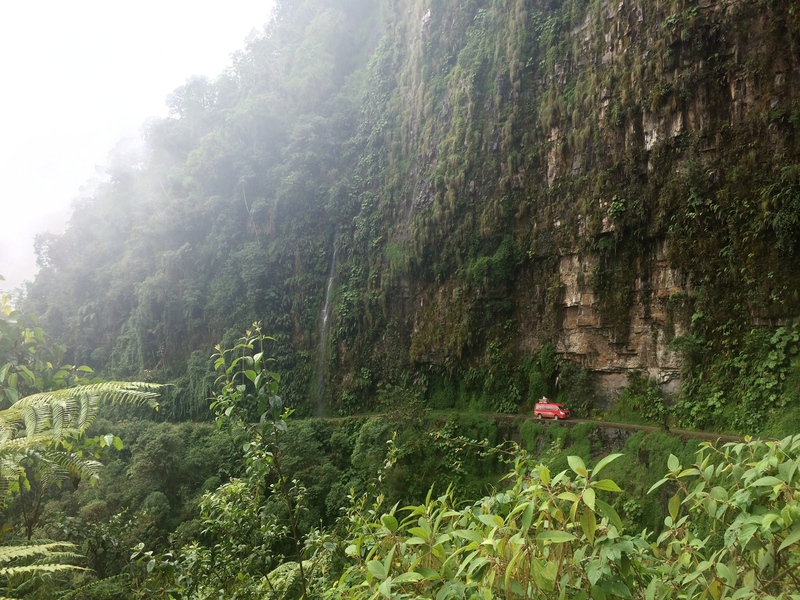 Downhill mountain biking through a rainforest with waterfalls? Yes, please! We thoroughly enjoyed the ride. Chris got this great shot of me. Whee! 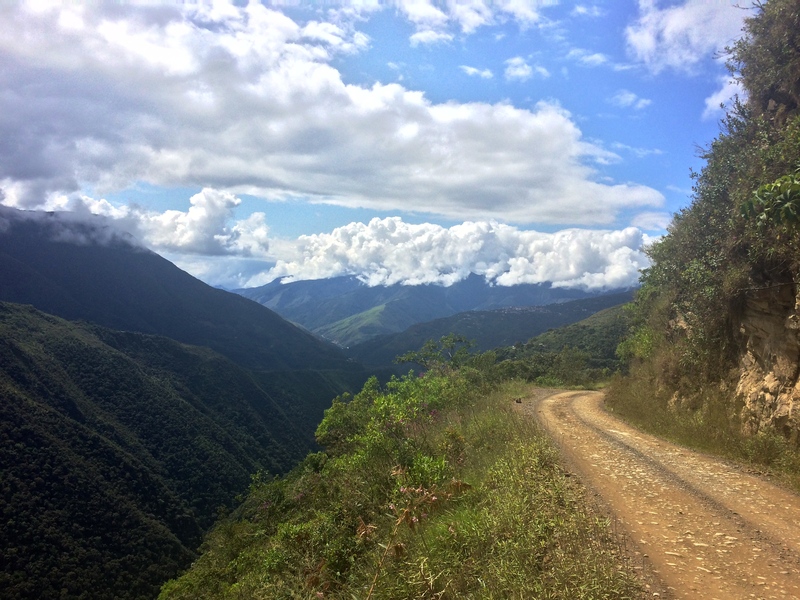 Toward the end of the ride, the skies cleared and the temperatures rose, allowing us to witness more spectacular scenery in the valley of the rainforest. All the bike excursions end with a lunch buffet at a hotel and pool, which is mediocre at best. Obviously this is an excursion that is catered to tourists–why the hell would any local do this? It is absolutely worth the time, effort, and cost. 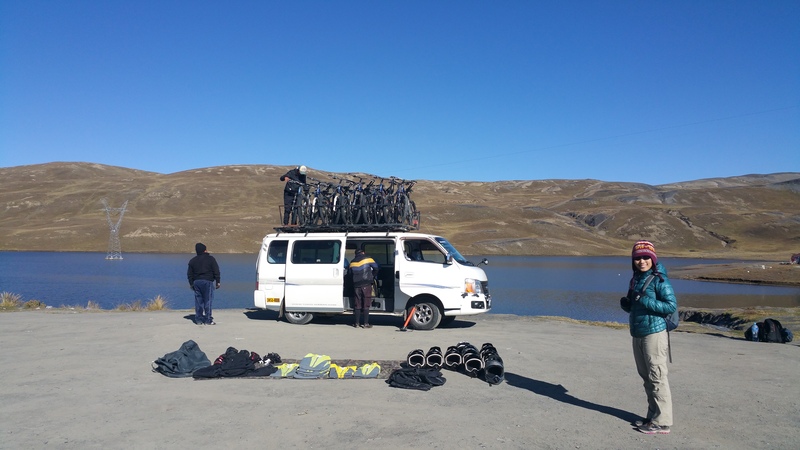 The experience is not as dangerous or thrilling as advertising makes it out to be; with common sense and little experience, it is another outdoor cycling experience. In the end, it wasn’t the “thrill factor” that I enjoyed. What did it for me was a reunification with a bike, and soaring above, through, and below the clouds in the valley of rainforests.